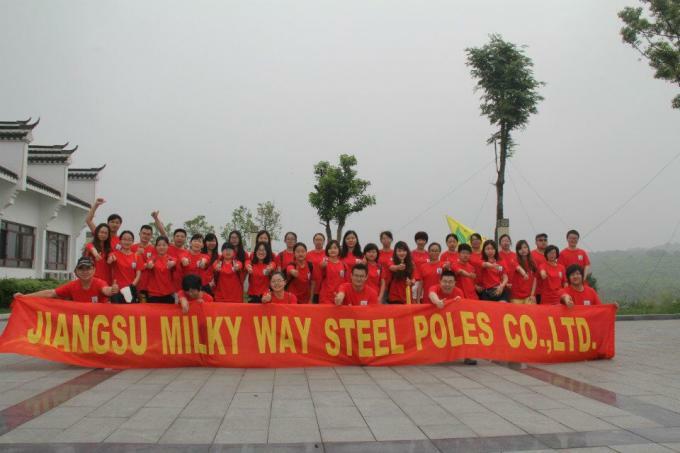 Estbilsed in 1989,Jiangsu Milky Way Steel Poles is located in Wuxi,East of China ,near one of the largest sea port of China ,Shanghai,Port . 2. Introducing ISO management ,We are awared ISO 9001:2008 certificate . .
3. 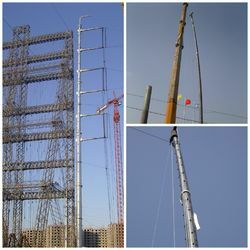 Lofting and design software :We have transmisson power pole design software which can help us design all kinds of steel pole ,at the same time ,the TMA and LMA are adopted by us to provide the design the drawing accuratly . 4. 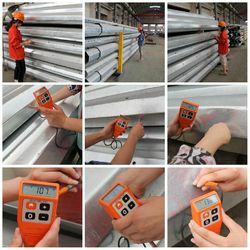 QC Inpection:It is our company policy that all the finish product should be inspected by our specialzed QC in every manufacure steps and beofore every shipment . We are always persisting in horzontal cooperation with domestic senior project institute and technical colleges .The enterprise also has an highly qualified team working at R&D ,manufacure ,QC ,aftersales service and other important positions . 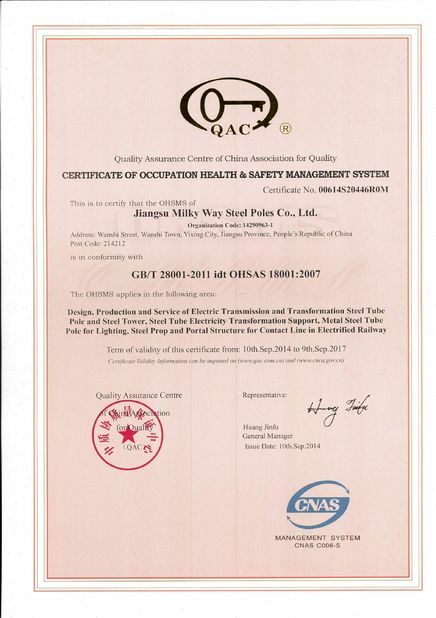 JiangSu Milky Way Steel Poles Co., Ltd.was established in 1991, is located in Yixing City, Jiangsu Province, Wan Shi Town, covering an area of 35,000 square meters, annual output value reached 200 million Yuan RMB. We have a long history of 20 years on product design, production. 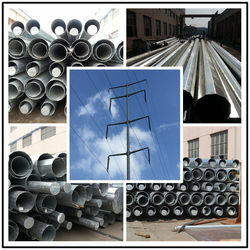 Our main products are power pole, communication towers, street lighting poles, steel bracket and so on. 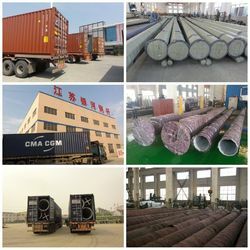 The company has strong technical force, advanced production equipment, perfect quality management system, product quality has reached international advanced level. 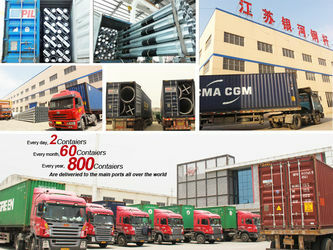 After 20 years of development, our company products are exported to overseas. Pakistan, Germany, Nigeria, Singapore, New Zealand, India, the Philippines, Australia and so on, we have shared a broad market.Our products are well knowed. Now the capataity of Exports has taken 40% of company sales, which made us become one of the leading export enterprises in china. Our development is based on quality, which allows us to always be able to stand ahead of the industry. In 1995, because of the introduction of the ISO9001 quality management system, our product quality has been further increased and guaranteed. We have advanced testing equipment and experienced technical engineers. This gives us continuously improve product quality to meet customer needs. 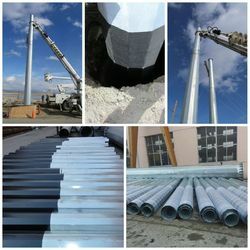 Based on product characteristics, we divide the inspection into four phases: raw materials inspection, production process inspection, finished product inspection and regular inspection. Ours Qc have been engaged in quality work for a long time and they consists of our quality deapartment . 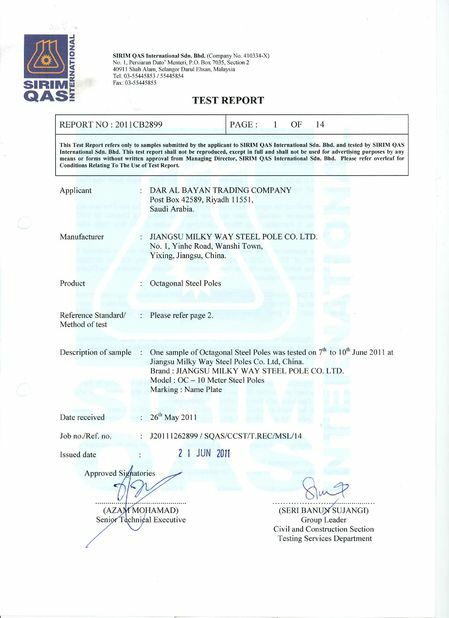 We implement the ISO9001 completely in during the process of productiong , proposed a concept. " the best way to return customers is to provide high-quality product" ! 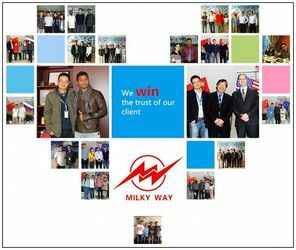 In order to share a larger market, Milkyway established a strong sales network and perfect after-sales service in hometown, in addition, we also focus on developing a larger market abroad. Our employees have a strong belief that "to produce for the market and customers high-quality products." Here , we all believe that a better future to come.